Is your back fit for work? One of my current patients came in with lower back pain after she was given a standing desk at work. She had not experienced lower back problems in sitting, but because so many of her work colleagues had, the employer is accommodating this with ergonomic standing desks. This particular patient had a weak lower back, so she wasn’t physically fit enough to stand and work. Sitting on her own wasn’t the problem. Most of us don’t think about how fit we are for work, but considering the repetitive nature of most of our jobs, it is worth thinking about. I’ve been seeing a lot of patients recently who have clearly tipped the balance towards work and no exercise, and many now cannot sit in a chair because of debilitating lower back pain. One of the main problems with sitting for long periods of time is the constant rounding of the lower back. Ideal posture is to have a gentle curve so that the vertebral joints and discs are evenly loaded on each other. When the lower back loses its natural lordotic curve the posterior section of the discs weaken and become prone to bulging or herniations. Another effect from sitting is that the hip flexors become shortened, causing more compression on the lower back joints and discs. When these muscles become tight, they can pull on the lower back with walking, or even standing up from a chair. I’ve seen patients who report their back will ‘go out’ when they stand up, after sitting for a long period of time. When this pattern occurs over a long period of time, the hip flexors cannot even perform their role as a stabilizer of the lower back as they are now too tight. Luckily there are plenty of preventive measures that you can do to avoid this scenario! In the position below, you tuck your pelvis under by tightening your buttocks, then move your pelvis forward slightly. If they are tight, the pelvic tuck is enough. Hold the stretch for 30 seconds and repeat it twice on each leg. 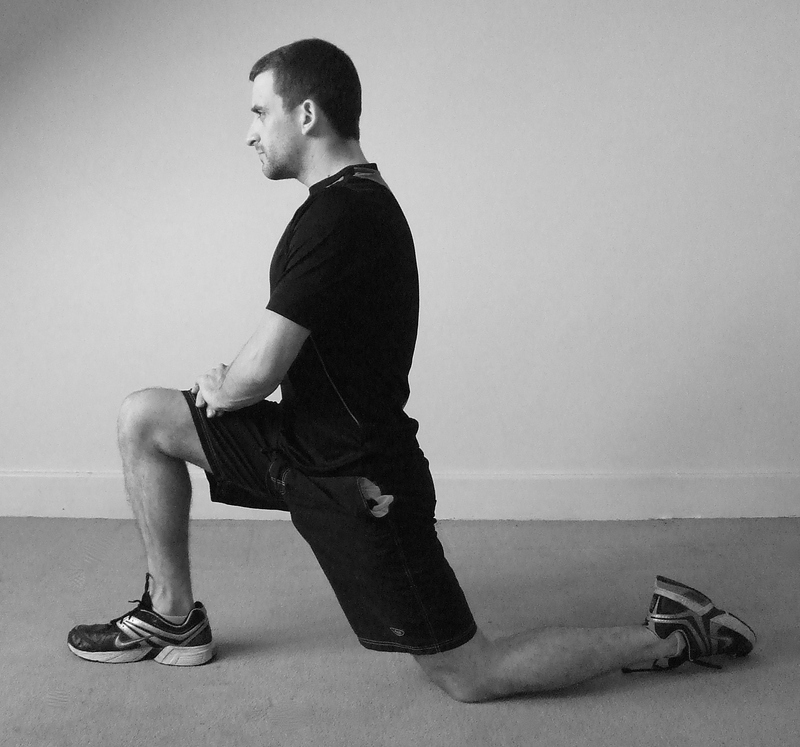 Stretching should always be gentle, particularly the hip flexors, so aim for 4/10 intensity with the stretch. It is better to hold onto a chair to the side, allowing the muscle to relax. As long as you don’t have a manager breathing down your neck, take some regular walk breaks to open up the front of the hips. If you can’t take regular breaks, then walking at the end of the day will lengthen these muscles. In the winter, these machines are great for hip movements, allowing the front of the hips to open. You want to stay away from the stair master machines which tend to shorten hip flexors, and find the ones that mimic a cross-country ski action. A back support that encourages the normal arch in the lower back will help to balance the load through the vertebral joints and discs. Make sure your feet are flat on the floor or on a stool. If your feet are dangling off the floor, you will use your hip flexors too much to keep you upright. In the case of my patient who had back pain standing at an ergonomic desk, we found she had weak lower back and abdominal muscles, and not enough gluteal strength supporting her pelvis. When this is achieved she will have more support in her back for both sitting and standing at work. Take care of your posture, and live a healthy life!